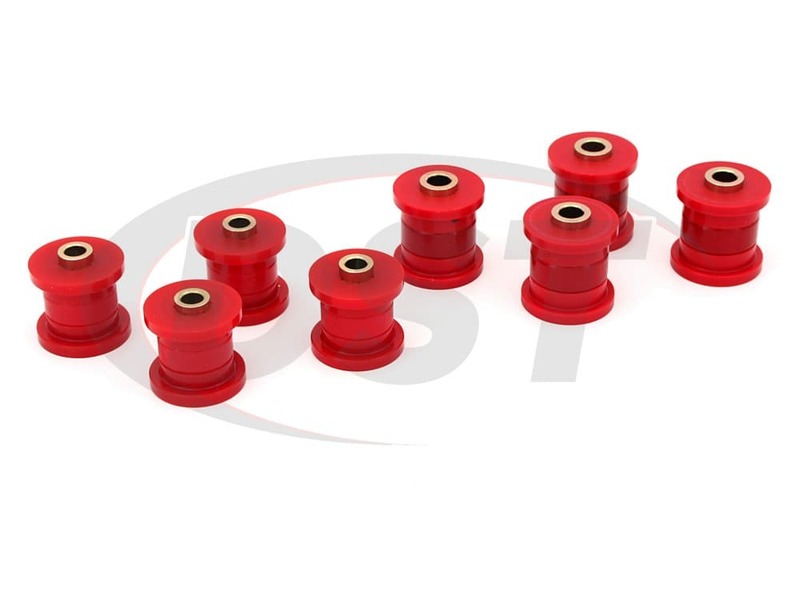 These Polyurethane Rear Control Arm Bushings from Energy Suspension will replace the original, soft rubber bushings in your 98-02 4Runner 4WD, holding a steady camber angle during turns and restoring even rear tire wear. The original control arm bushings on your 4Runner are made of rubber and connect the control arm to the frame. Rubber is an excellent vibration isolator because it is soft and provides a smooth ride, but the cost of this smooth ride is a weak connection between the control arm and the frame. 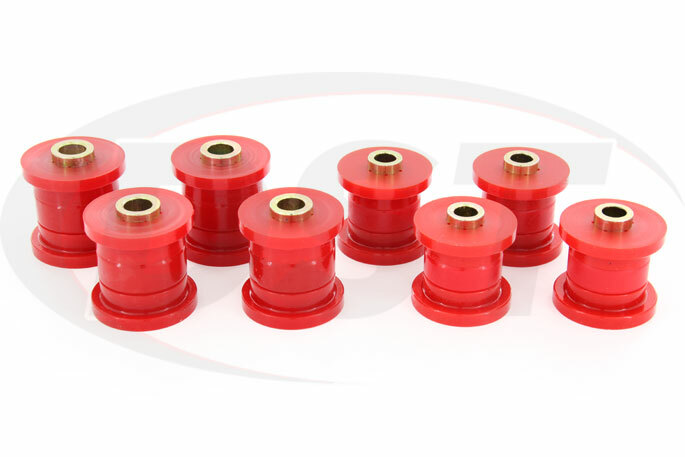 Those bushings flex and can allow wheel alignment to change as the suspension travels, especially during a hard turn, reducing traction when you really need it. Not only this, but rubber wears down relatively easily and when these bushings degrade there is even more play in the control arms. If your rear wheels have a positive or negative camber you will find yourself replacing tires sooner than you expected. 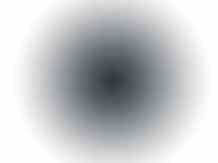 This is because the tire is tilted and riding on its edge instead of the full contact patch like it was designed to do. In extreme cases this misalignment caused by worn out rear control arm bushings can result in rear steering and detract from the amount of control you have over your 4Runner. Whether you're on the trail or the interstate tire alignment is a big deal. If you're running some knobby off-road tires on your 4Runner then the contact with the road is already reduced so you don't want a tilted wheel causing traction loss. Even road tires with several degrees +/- camber can lose a significant amount of contact patch area. 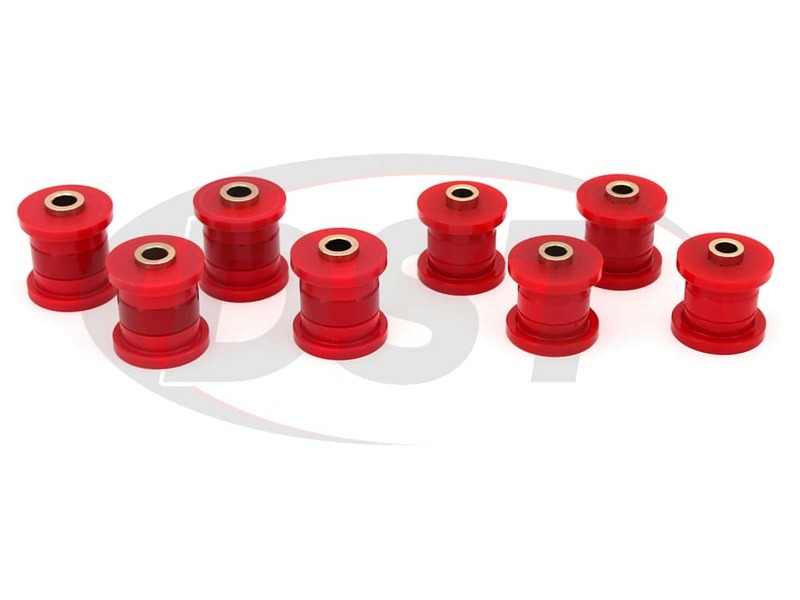 Energy Suspension manufactures their rear control arm bushings with polyurethane which is a much stronger material than rubber. Polyurethane will hold its shape much longer than rubber and keeps the alignment of your rear wheels at a steady angle. It isn't affected by heat, road grime, or road salts, all of which begin eating away at rubber bushings. Since the connection between your wheels and the chassis is firmer with polyurethane, more vibration will be transferred to the cabin of your 4Runner. This is a downside but you'll have to decide between trading an increase in NVH to more performance and longevity. 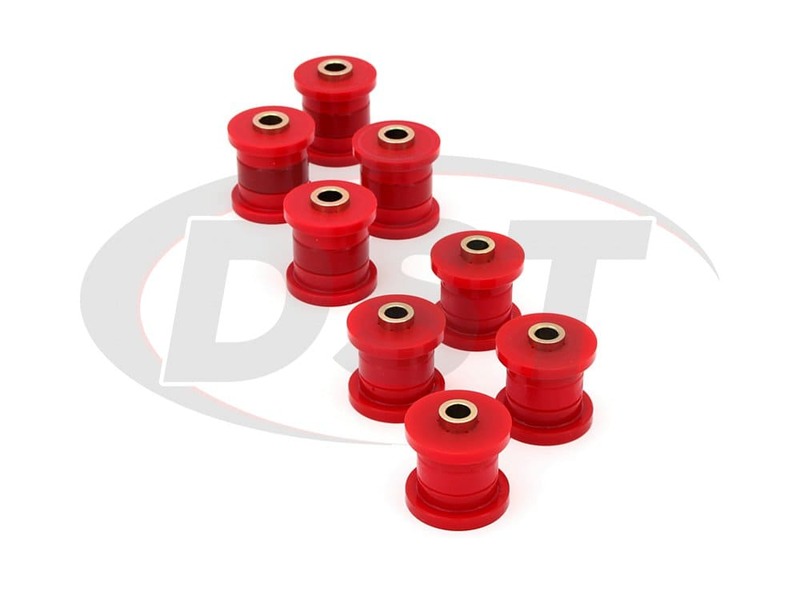 Speaking of longevity, these bushings are covered by our DST exclusive lifetime warranty. 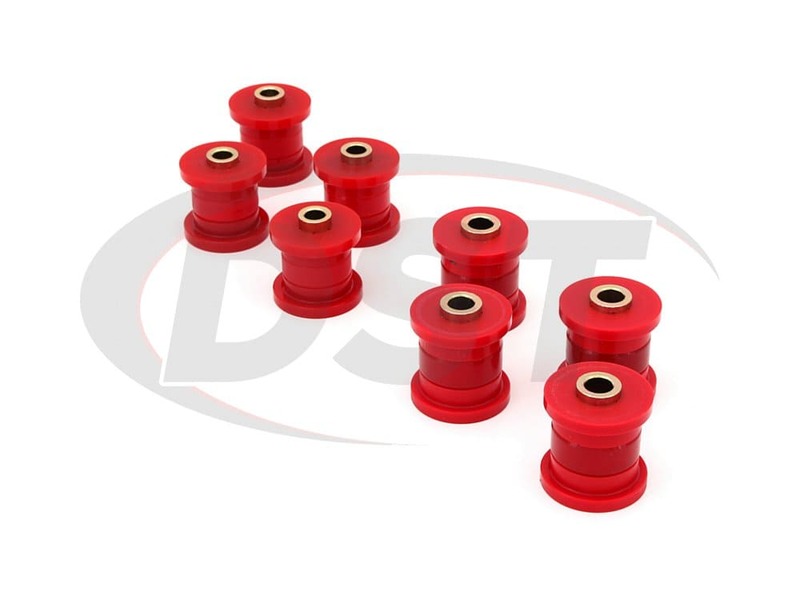 These kits will replace all of the rubber suspension bushings with polyurethane bushings that should last the life of your 4Runner, and that's backed up by our DST exclusive lifetime warranty. These were exactly what I needed. I had to use a sawzall to get the old pressed ones out. Easy fit just needed to use some of the lubes they came with. Perfect fit and well made. Was very happy with the product.Easy to install with the 3 piece system. I will order other bushing for my 4 Runner soon. What part of the bushing on part number 8.3133 do I need to grease? 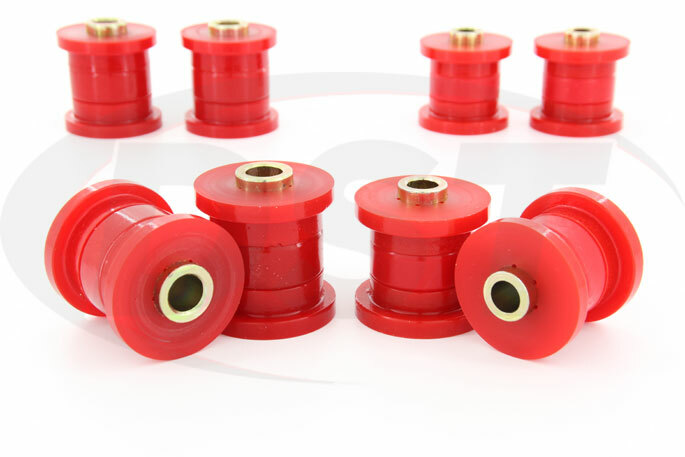 You will need to grease the outside of the bushings, from flange to flange, and then you will need to grease the inner sleeve for the bushings. Anywhere that will come in contact with metal, you will need to grease. Will the 8.3133 fit on my 97 4Runner? Unfortunately the 8.3133 is only fitted for the 98-02 4Runners. We can not suggest these to fit for the 97 4Runner unfortunately. 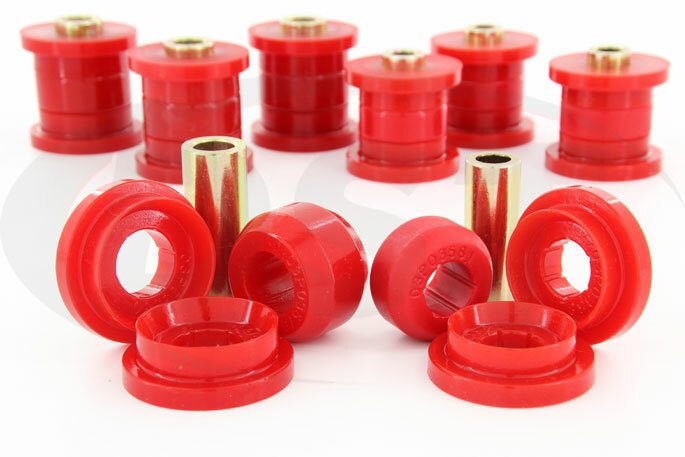 Is there a way for me to just one or two of the Rear upper control arm bushings out of this kit? 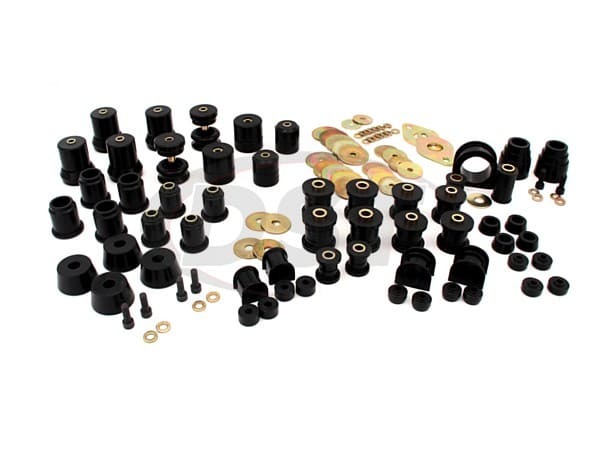 I lost a bolt while driving and lost bushings along the way, and I do not want to purchase the whole kit again. We do offer just the pieces out of Energy kits. If you wold give us a call at 888-406-2330 our reps will be able to help you further. Is the 8.3133 for both sides, All 4 control arms, or just for one side? 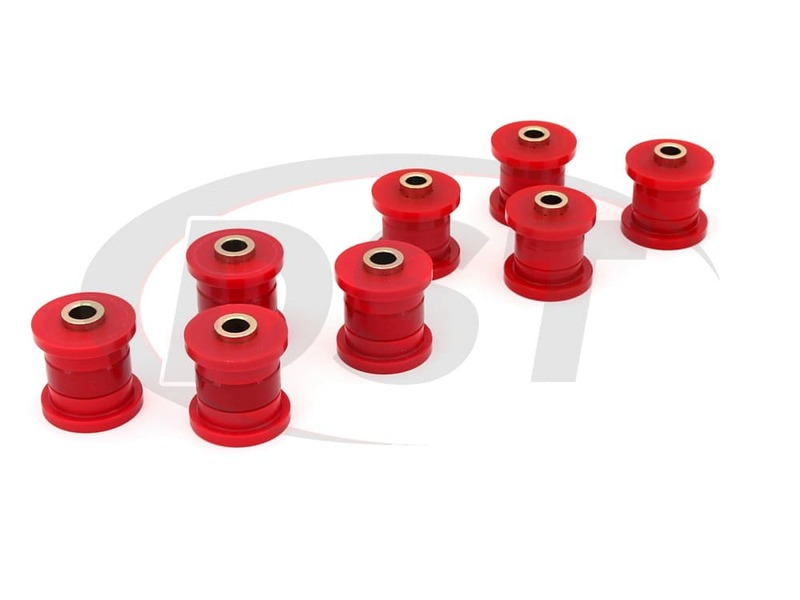 The 8.3133 will include the left and right upper and lower control arm bushings ( all 4 control arm bushings replacements) for your Vehicle. Is part number 8.3133 for the upper and lower control arm bushings or just the lowers? Part number 8.3133 is for both the upper and lower control arm bushings. Am I correct that this is all bushings for upper and lower rear arms ?